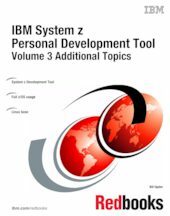 This IBM® Redbooks® publication introduces the IBM System z® Personal Development Tool (zPDT), which runs on an underlying Linux system based on an Intel processor. zPDT provides a System z system on a PC capable of running current System z operating systems, including emulation of selected System z I/O devices and control units. It is intended as a development, demonstration, and learning platform; it is not designed as a production system. This book, discussing more advanced topics, is the last of three volumes. The first volume introduces zPDT and provides reference material for zPDT commands and device managers. The second volume describes the installation of zPDT (including the underlying Linux, and a particular z/OS® distribution) and basic usage patterns. The third volume discusses more advanced topics that may not interest all zPDT users. The IBM order numbers for the three volumes are SG24-7721, SG24-7722, and SG24-7723. The systems discussed in these volumes are complex, with elements of Linux (for the underlying PC machine), z/Architecture® (for the core zPDT elements), System z I/O functions (for emulated I/O devices), and z/OS (providing the System z application interface), and possibly with other System z operating systems. We assume the reader is familiar with the general concepts and terminology of System z hardware and software elements and with basic PC Linux characteristics.